This post is a day late since I've been feeling under the weather, but I finally have it all ready to go for you. 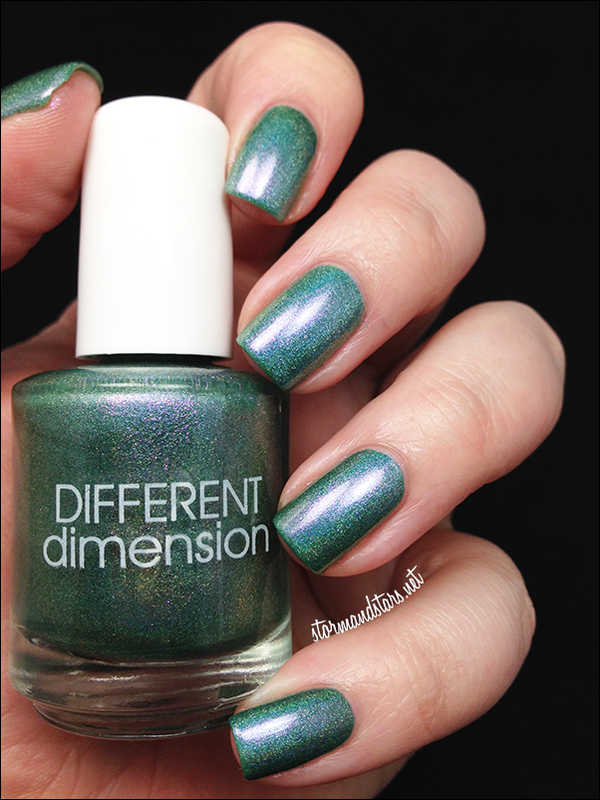 Different Dimension is one of the leading indie brands in my opinion, so of course I accepted when brand owner Missi asked for my help in reviewing and swatching her holiday 2013 collection, Happy Holly Days. 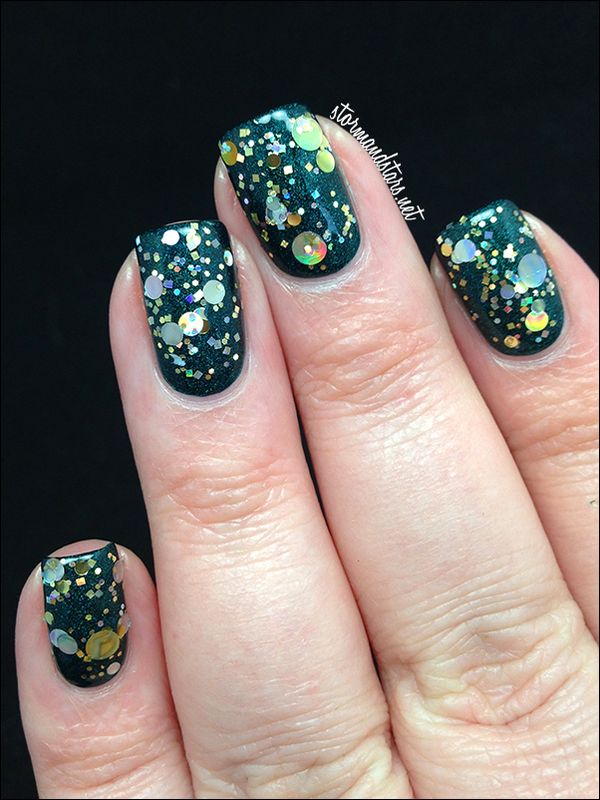 This collection has a mix of finishes and styles ranging from glitter topers to shimmery holographics across 11 unique lacquers. Lets get right to the photos shall we? 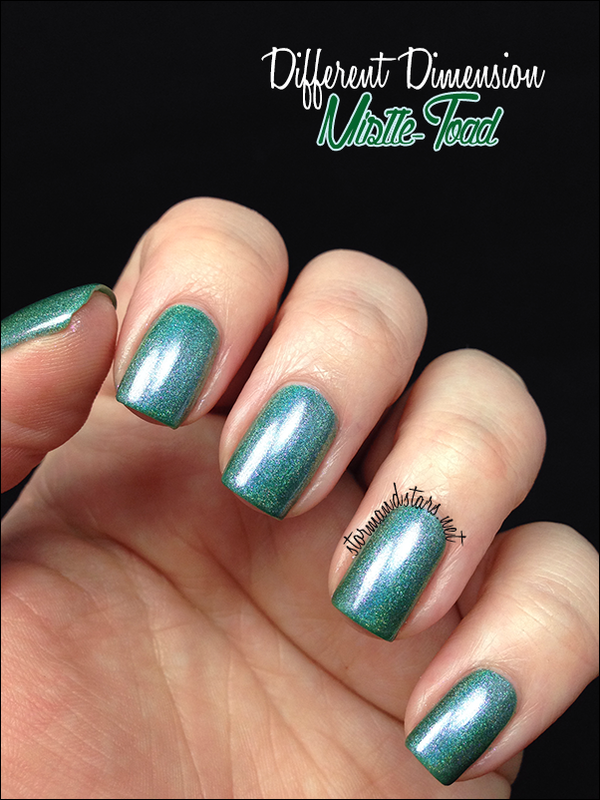 From Different Dimension: "Mistle-Toad is a pine green linear holographic polish with heavy pink shimmer that also gives a semi duo chrome effect"
This lacquer applies like a dream and I used three coats plus topcoat for these images. 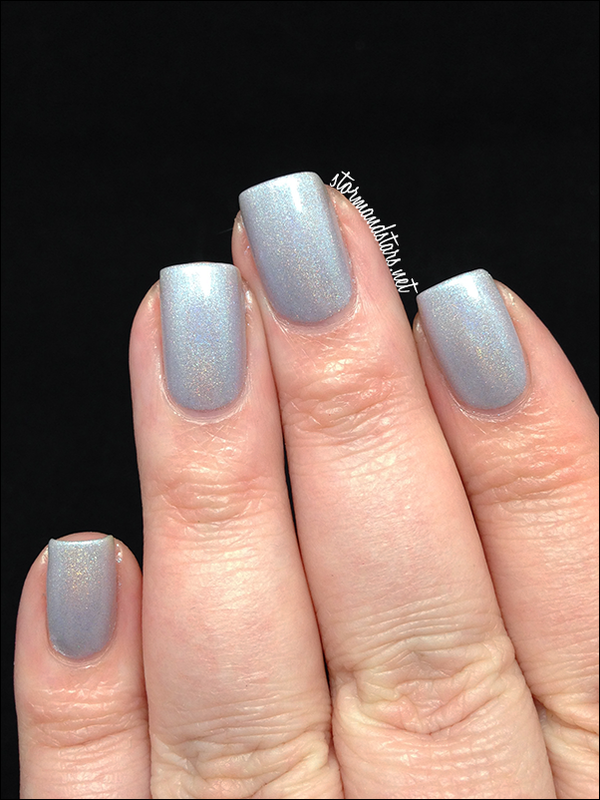 I did not notice the topcoat diminishing the holographic effect, although it is much more prominent in person than I could capture in these photos. You can see the pink shimmer here in the bottle and I will say the shimmer is also much more noticeable in person. 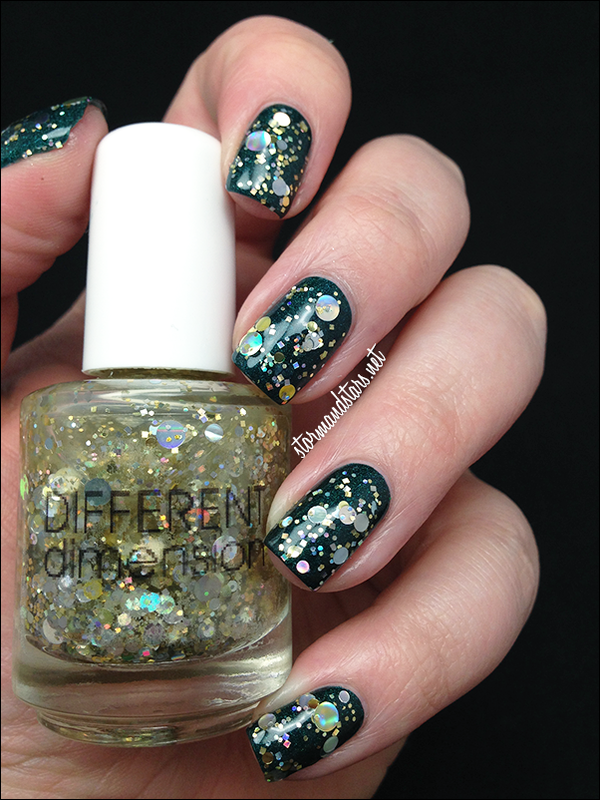 This is a great polish for the holiday season if you're looking for something a little more subtle than glitter. Can We Carol On is the other linear holographic of this collection. 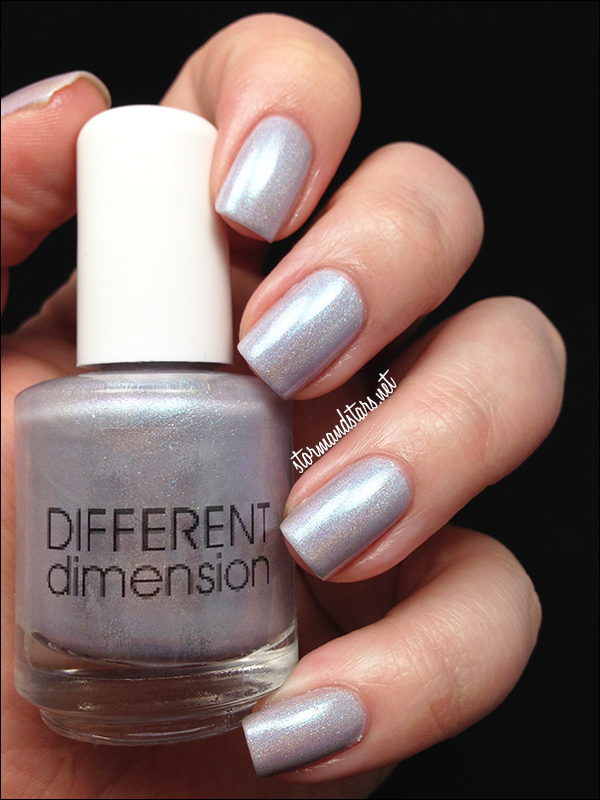 From Different Dimension: "Can We Carol On is a creamy light dusty lavender holographic polish with blue shimmer." I absolutely LOVE this shade! 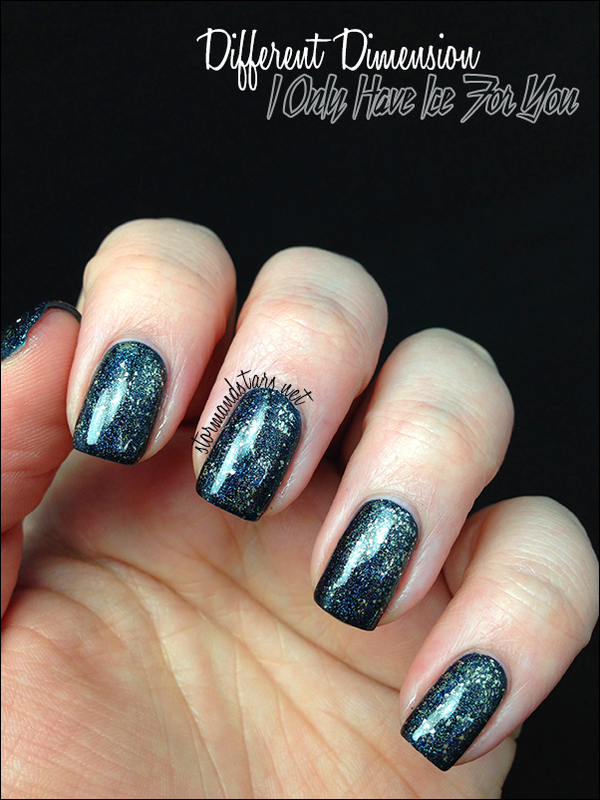 The blue shimmer is perfect in it and everything about it is soft and sparkly. 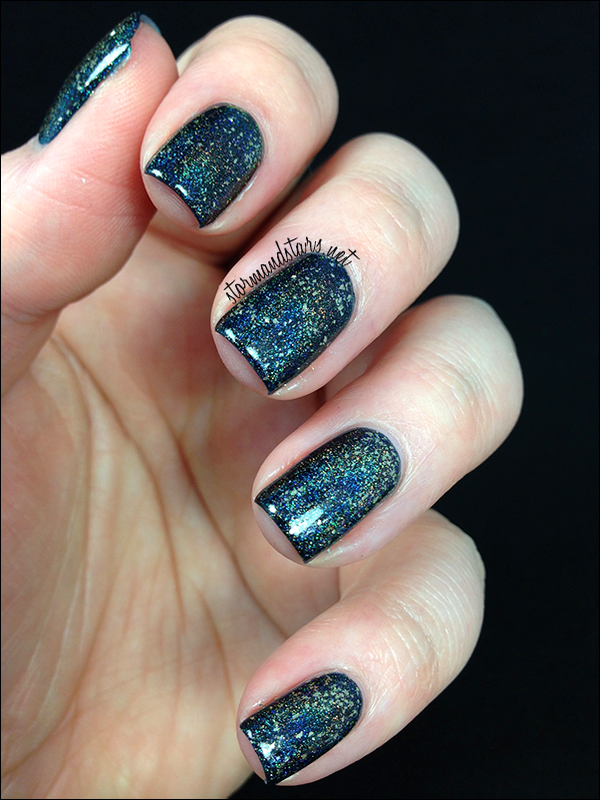 The formula on this was great and I used three coats plus topcoat for these swatches. You can see the holo effect above, though as before it is much more noticeable in person. I seem to have some trouble capturing holographic lacquers with my camera without the sun to aid me. I highly recommend this lacquer if you like silver and purple as it gives you a little of both in the finish! Next here is This Is Not Fir, one of my favorites from this large collection. 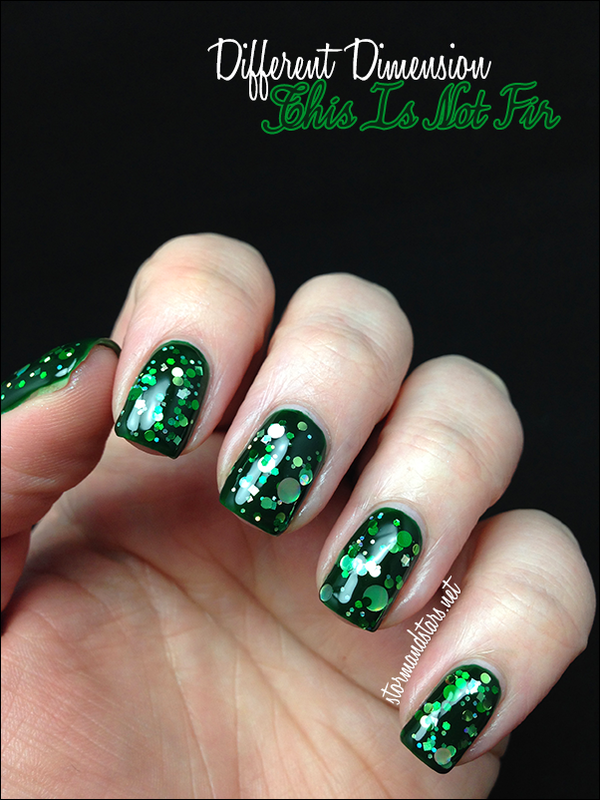 From Different Dimension: "This Is Not Fir is a grass green jelly polish with silver and green circles, squares and hexes throughout." I love love love love this polish!! I layered two coats of This Is Not Fir over Illamasqua Rampage, which is a bit darker than the jelly base, but worked out nicely for the photos. <3 I added a coat of Seche Vite to smooth everything out and make it shiny. I had no formula issues with this polish and I didn't have to dig for the glitter, I got plenty on my brush with every dip. I did turn the bottle upside down for about 10 minutes before painting to make sure the larger circles were closer to the top. 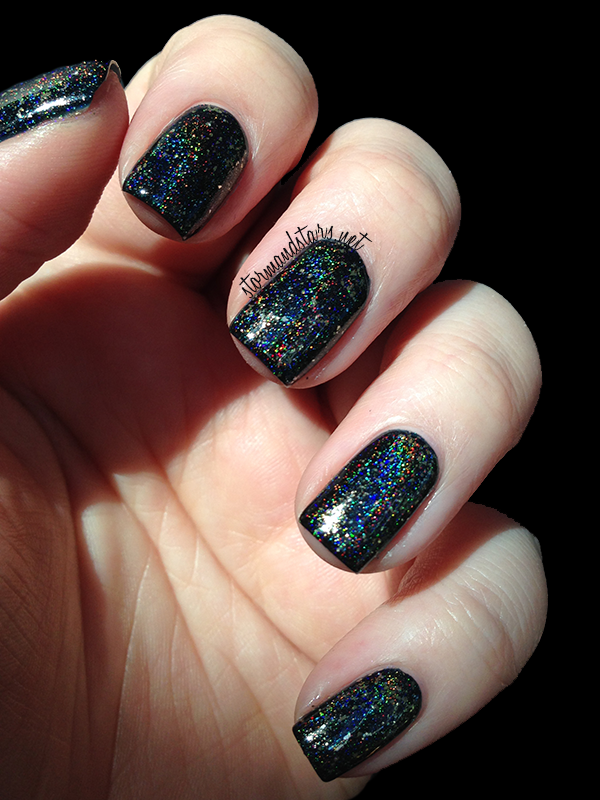 Next up I have a special holographic topcoat for you called I Only Have Ice For You. 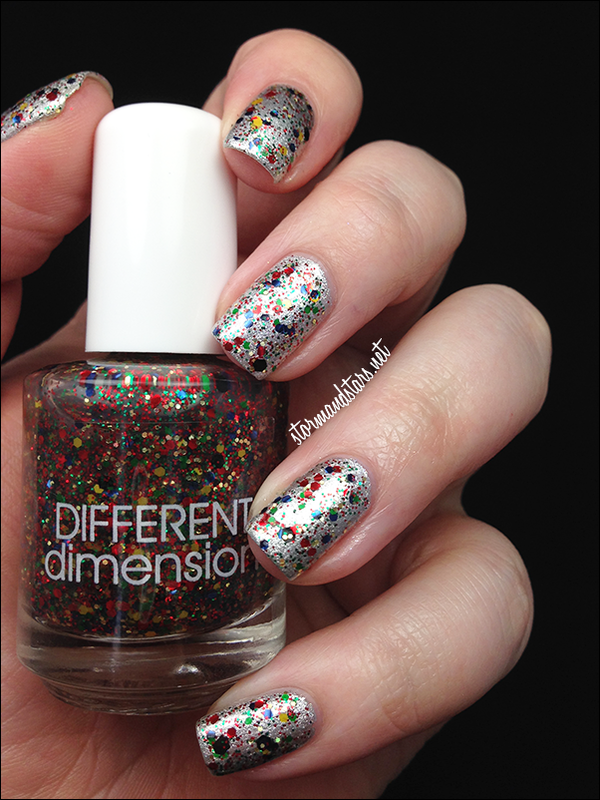 From Different Dimension: "I Only Have Ice For You is a holographic top coat with sterling silver micro flakies!" This top coat will really look fantastic over everything both indoors and out in the sun. 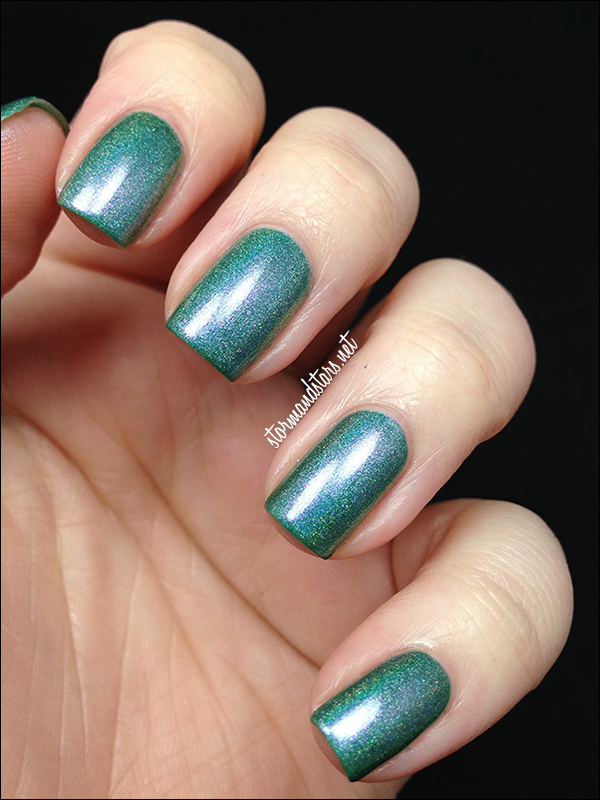 This photo is in indoor lighting and the polish is slightly holographic, but not fully. You can see the photo I managed to get in the sun when it peeked out yesterday for a short time. The effect is much more holographic! It looks great! For these images I used one coat of I Only Have Ice For You over Cult Nails Living Water. Unfortunately I think I chose something a little too dark as it looks like it is over black. 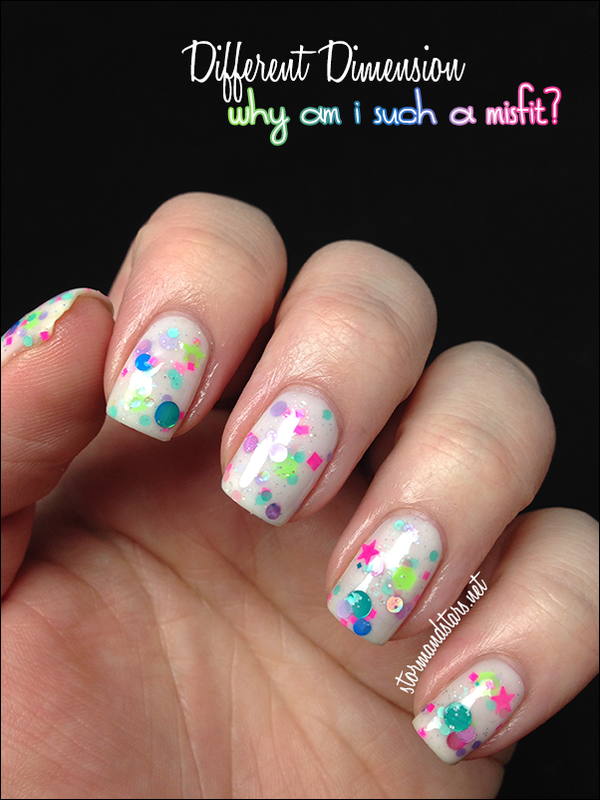 The formula on this was great, and I didn't even use topcoat for the above photos! Next up is one of the more blingy lacquers and I love it! Here is Tinsilitis. Look at all that sparkle and silver! There is so much glitter in this baby! 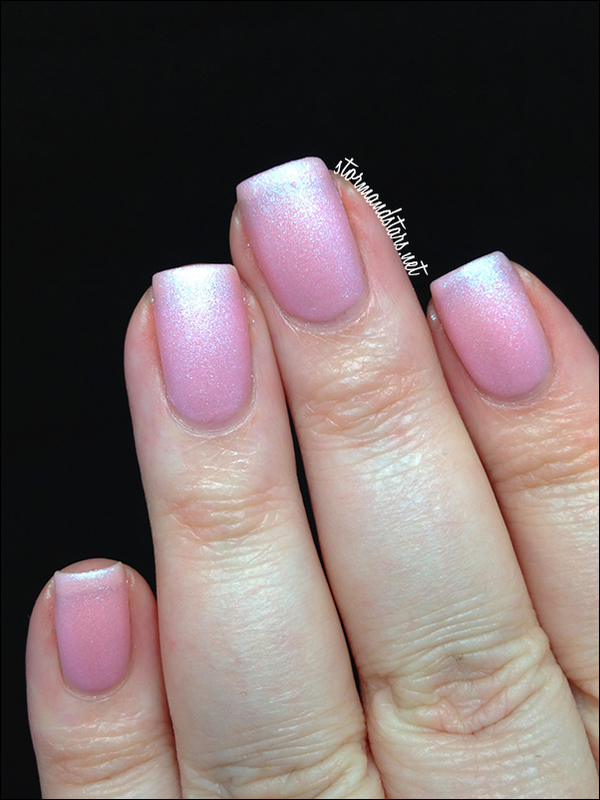 These photos show ONE COAT over Dior Marilyn (Yum) plus a coat of topcoat to finish it off. I love this one for the holiday season and I think it'll look great over so many colors in the future! You're Not Making Any Frankincense is like the sister to Tinsilitis. From Different Dimension: "You're Not Making Any Frankincense is a gold and silver circle glitter bomb. Gold and silver circle, hex and square glitters in a variety of sizes in a clear base will look amazing over an array of colors." I concur! This will look great over just about anything@! I chose to layer this glitter bomb over AEngland Saint George, which is my all time favorite lacquer. I added topcoat to smooth it all out after. I did dig for a few of the big circles, but mostly just because I wanted more for my swatches, lol. You really don't have to dig for anything in this as long as you don't mind random! That's Snow Joke is another beautiful glitter bomb. Can't you just feel the winter coming from my nails? 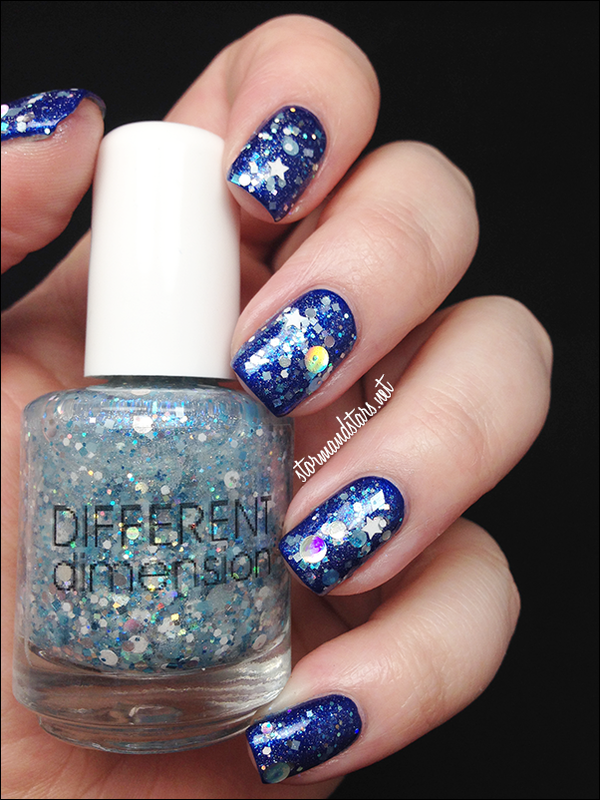 From Different Dimension: "That's Snow Joke contains blue, white and silver glitters in a mixture of sizes and shapes all in a clear base with silvery blue shimmer." 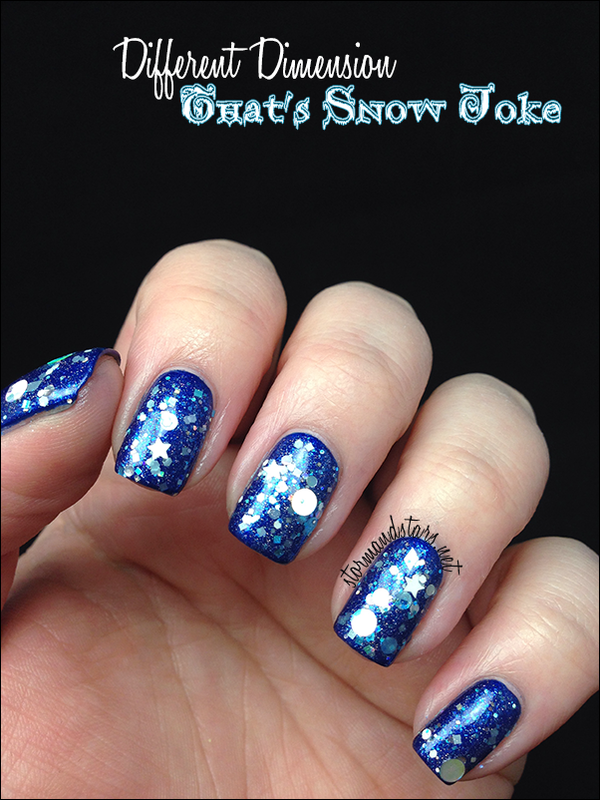 For these photos I used one coat of That's Snow Joke over Zoya Song plus top coat. 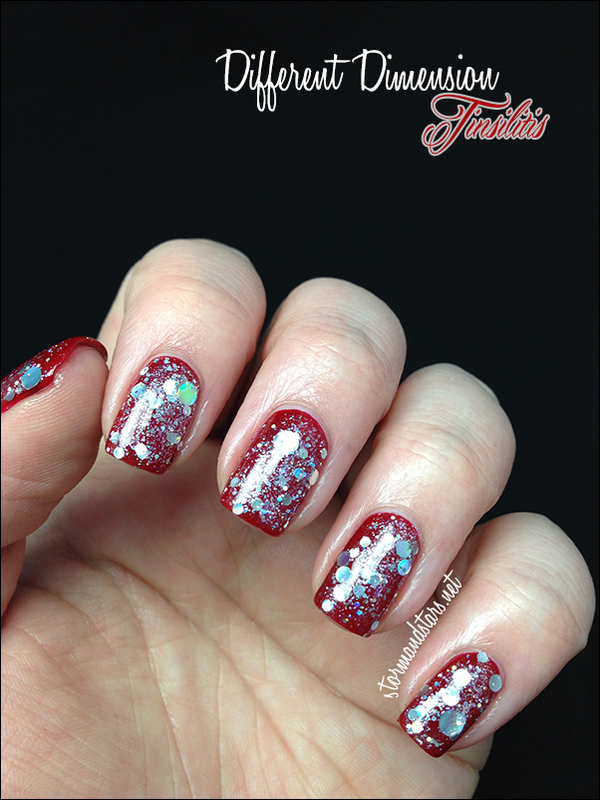 Absolutely no formula issues and I didn't have to dig for even the larger glitters in this one. 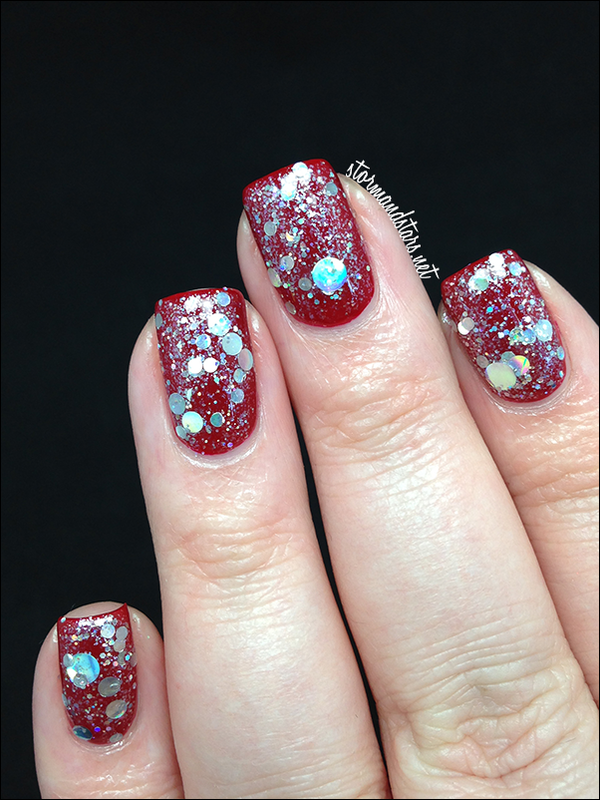 This super Christmassy lacquer is Don't be The Santa of Everything. From Different Dimension: "Don't Be The Santa Of Everything is Christmas in a bottle! Red and Green circles mixed with some squares and hexes"
This would really look great over any christmassy color, but my girlfriend suggested gold for it and I love how lush it turned out! 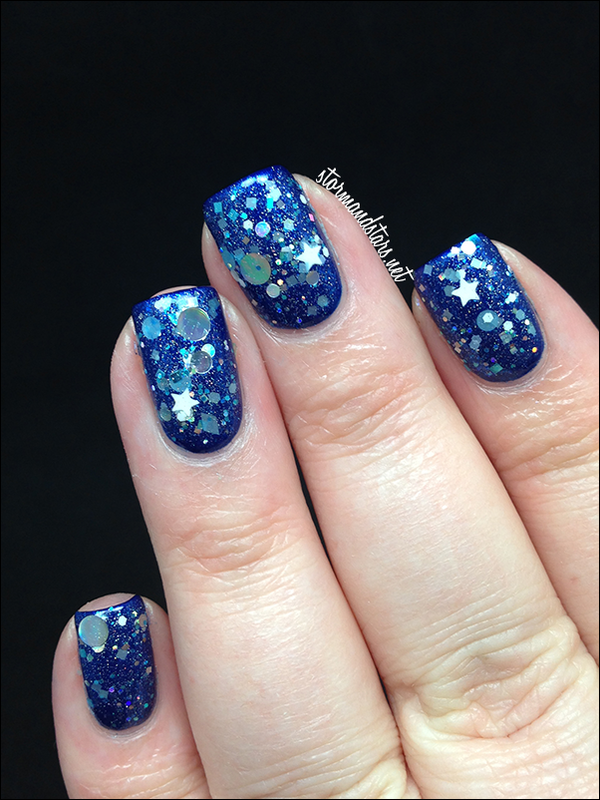 This is one coat plus topcoat over Zoya Ziv. I did do some placing of the big red circles, but nothing out of the ordinary. Look at all that red and green goodness in the bottle! 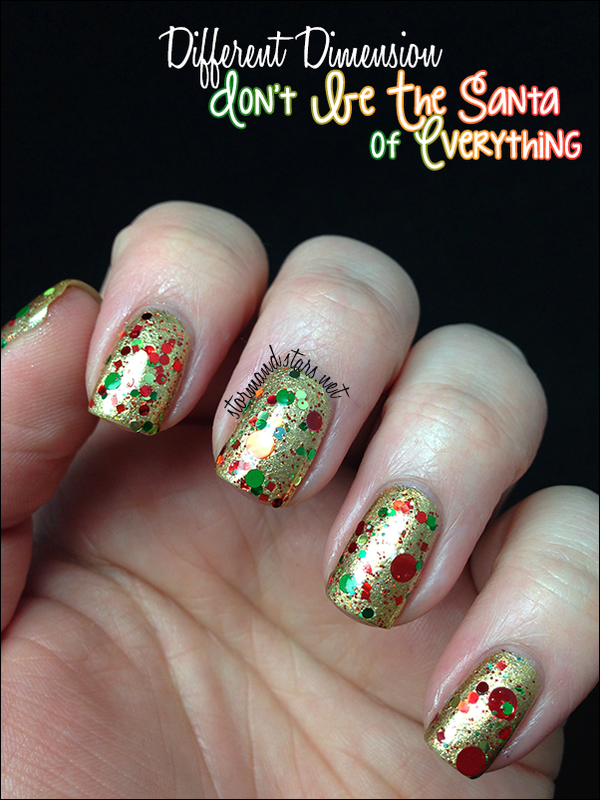 Another glitter topper, Christmahanakwanzika is back from last year! 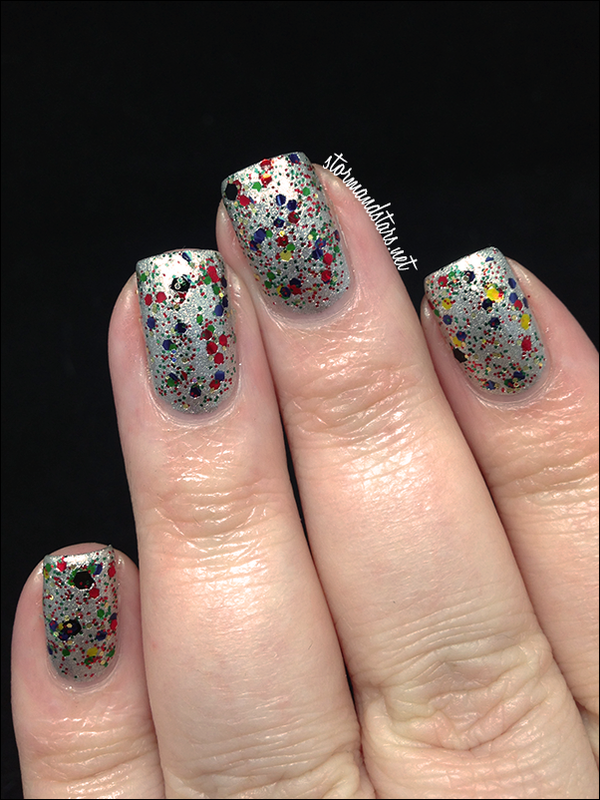 This lacquer is a blend of a little bit of everything holidays. From Different Dimension: "Christmahanakwanzika is revisiting from last year. This polish was named for the 3 most popular winter holidays, Christmas, Hanukkah and Kwanza. With all the wonderfully diverse holidays this time of year I decided it was important to try and make something fun for everyone to wear! 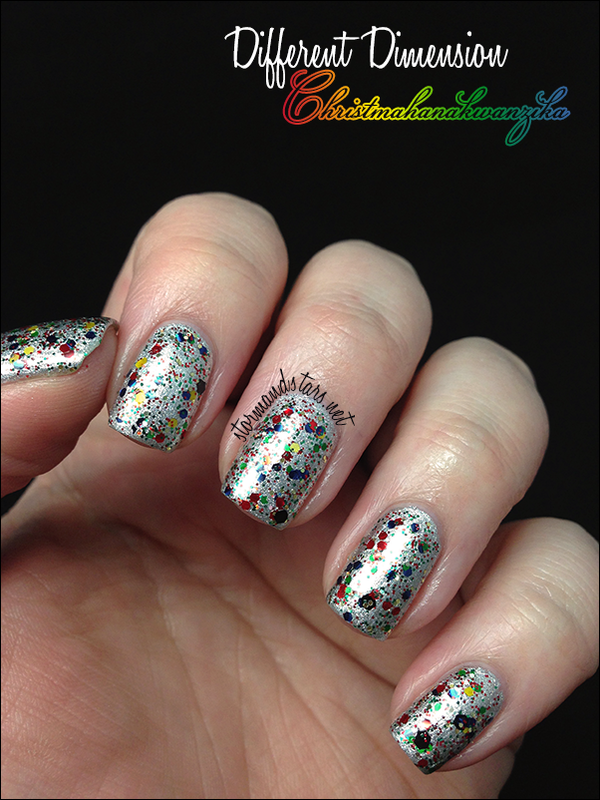 This glitter topper has red, yellow, blue, green, black and gold glitters in a clear base." Missy is definitely right about his having a bit of everything! 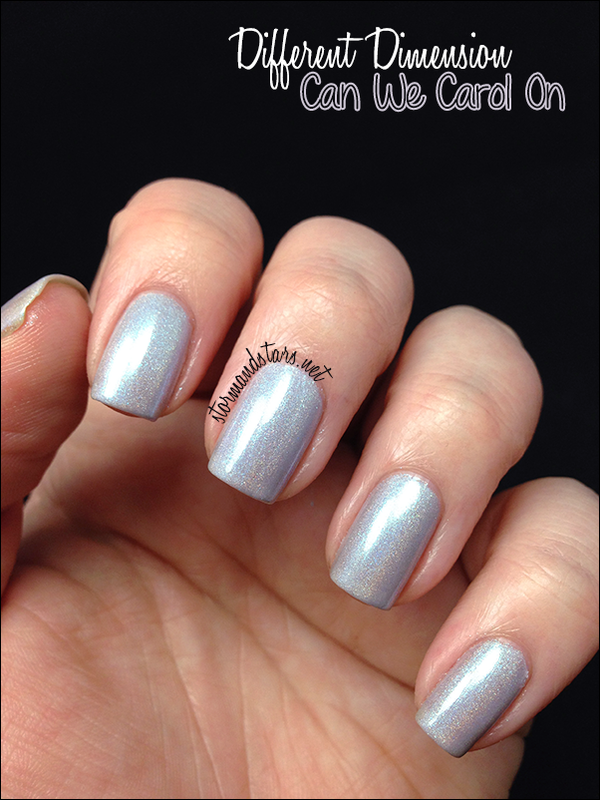 I layered one coat of this lacquer over Sally Hansen Celeb City, a metallic silver polish. I added a coat of top coat to smooth everything out. Look how much glitter! You could probably get full coverage of this in 3 coats. Next up is another favorite for me. Here is Load of Baubles. Please excuse how off my skin is in these photos, it really didn't want to cooperate. The polish is very accurate on the other hand! 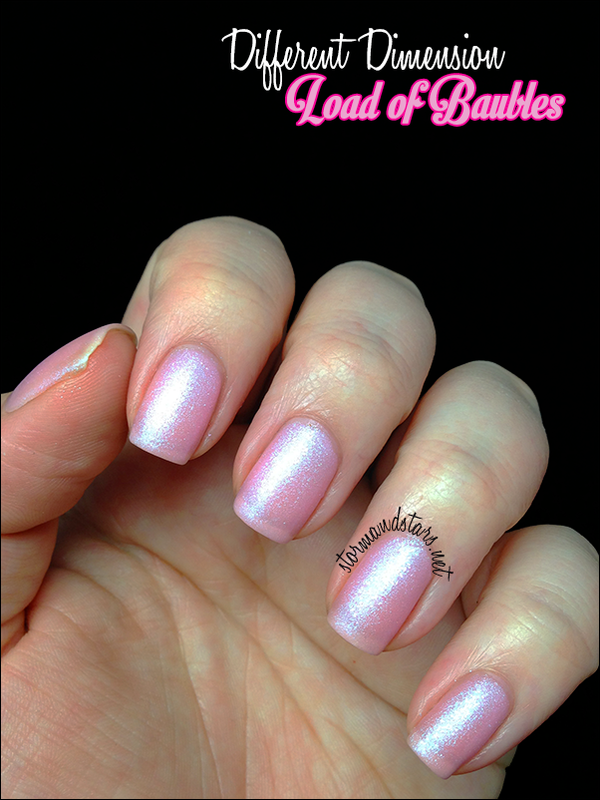 From Different Dimension: "Load of Baubles is a baby pink polish with heavy blue shimmer that dries to a matte finish." I didn't read the descrip before I put this one on and I was so pleasantly surprised but the beautiful matte finish! These images are three coats alone with no topcoat. Below you can see what this lacquer looks like after applying a topcoat to make it shine. Last up is my hands down favorite from this collection. Here is Why Am I Such A Misfit? I love that this polish doesn't really go with anything else in the collection, it makes it make even more sense with the name. I loved the look and the formula was perfection. From Different Dimension: "Why Am I Such A Misfit? is an ode to the Island of Misfit Toys. 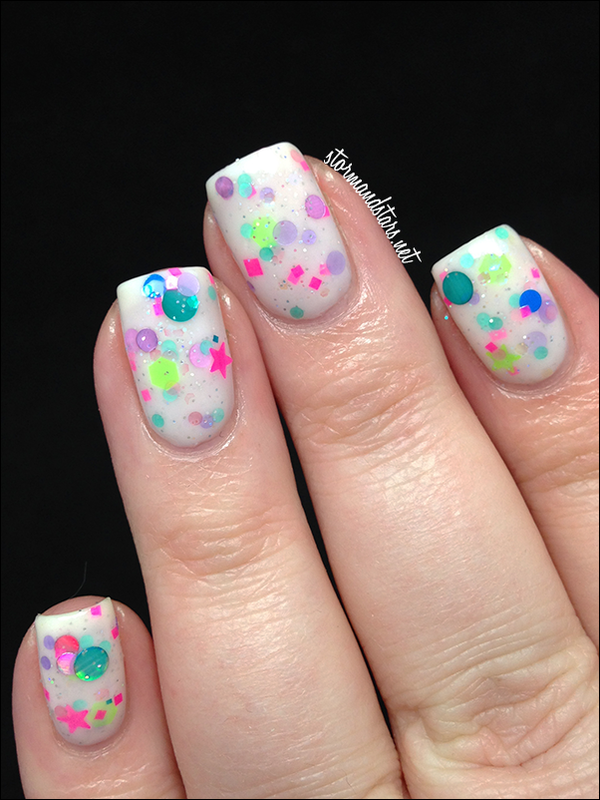 A White Crelly base packed full of so many fun glitters." As you can see in the bottle the base is a little off-white, but I layered two coats over Jolie Polish White Crelly and it lightened it up a bit. 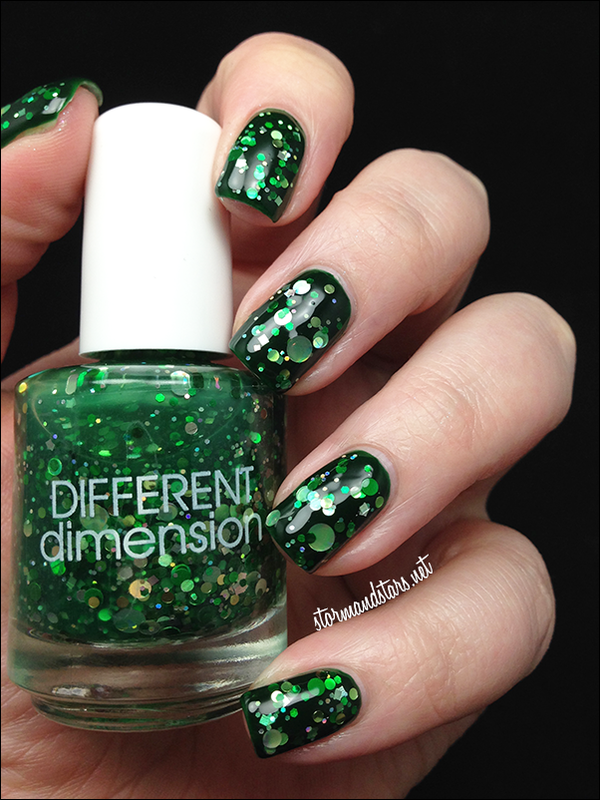 You could also layer this over a light pink or purple polish for a different look! Wow! I'm stunned! These are all fantastic and I am so glad I was given the chance to review them for you. My choices for must haves are Why Am I Such A Misfit, Load of Baubles, That's Snow Joke, Tinsilitis and This Is Not Fir. Which ones caught your eyes? 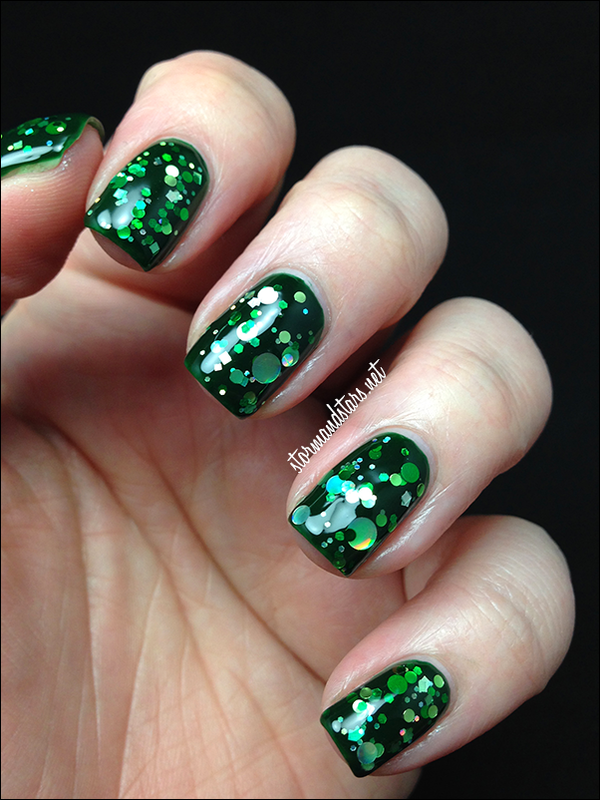 Are you planning on any special christmas polish purchases? 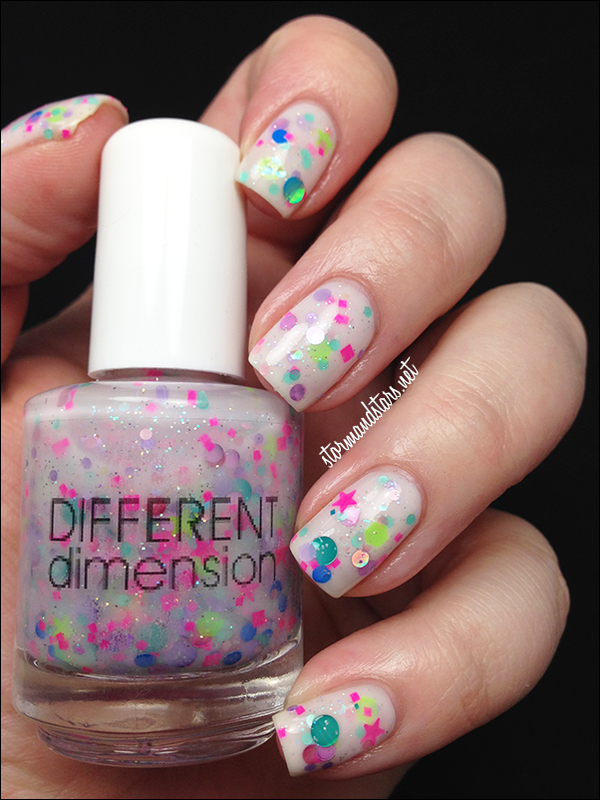 You can purchase these and other Different Dimension lacquers in the Different Dimension Shop. Last time I checked, most of the shades were still available, but there are a few that are sold out, so make sure to follow Missi on Instagram and Facebook for updates on future restocks!